Kisaku is old-school Japanese done very well. All the dishes ordered were flavorful starting with the miso and moving on to the tempura and sushi. To be honest it was Thanksgiving weekend and most of my favorites were closed but in the end Kisaku did not disappoint. It's easy to miss Han Sung which is nestled in a slightly dated strip mall in Santa Clara. However, once you see all the cars in the parking lot there's the realization you are in for a treat. My friends ordered the food which is a good thing since I had no clue where to start. Of course, kalbi is always a good choice and this was no exception. Cooked at our table, the meat was perfectly seasoned, tender and overall the star of my visit. 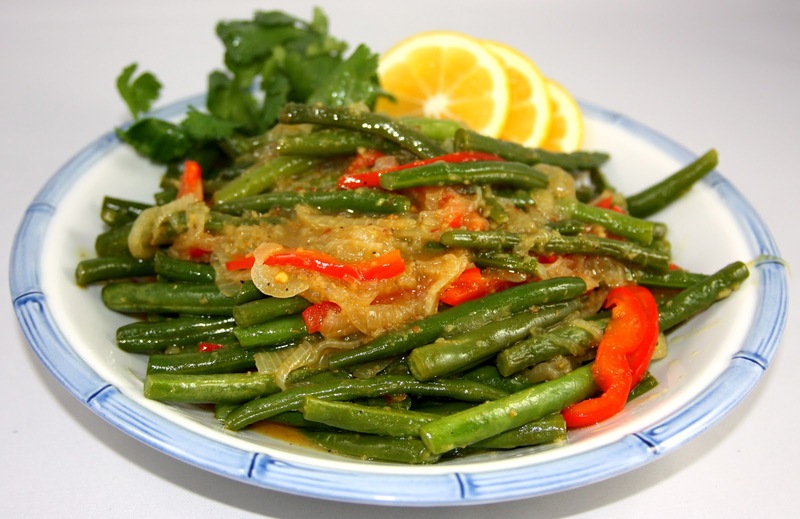 Coconut curried green beans - bright flavors with the perfect spice! Even dinner parties can fall into a rut with the same menu items showing up as "favorites". Recently I decided to shake things up with a new menu and Curried Coconut Green Beans from "A Spoonful of Ginger" by Nina Simonds. They were an instant hit with my guests and I've served them many times since. No green beans? Try broccoli or whatever you've got on hand as the curry seasoning is divine and the sauce great with rice. I happily add this recipe to my list of "favorites" and once you try it you will too! ½ cup fresh basil leaves, cut into thin strips. Trim the ends of the green beans. Rinse lightly and drain. Drop the curry seasonings into the feed tube of a food processor fitted with a metal blade while the machine is running. Turn the machine on and off to chop the seasonings evenly, mincing them to a course mixture. Pour the curry into a bowl. Heat a wok or large skillet, add the oil, and heat until hot, about 20 seconds. Add the curry seasoning and red onions, stirring over medium-low heat with a wooden spoon for about 3 to 4 minutes, until the onion is tender and the mixture is fragrant. Turn the heat to high, add the green beans and rice wine or sake, and stir fry about 1 minute, until the beans are a vivid green. Add the premixed sauce and heat until boiling. Reduce the heat to medium-low and cook, partially covered, for about 8-9 minutes, or until the beans are just tender. Sprinkle fresh basil and toss lightly for a few seconds. Scoop the beans and sauce into a serving bowl and serve immediately. *The recipe as written calls for 1 ½ teaspoons dried chile flakes. I’ve found one teaspoon to be quite spicy and ½ teaspoon just about right. Recipe courtesy of A Spoonful of Ginger by Nina Simonds. Kecap Manis, what is it you ask? It’s a thick soy sauce sweetened with palm sugar from Indonesia. This ingredient came to my attention via an older version of Saveur magazine and I knew instantly that I had to try it. After a bit of "test and learn" I created this marinade for flank steak that's easy to prepare and will leave your guests raving. Look for kecap manis in any Asian store or order online. Mix together all ingredients. Simmer 10 minutes over low-med heat. 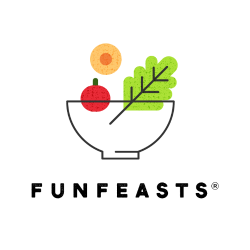 • This recipe will make enough marinade for 3 lbs of flank steak. Before marinating pierce all over with a fork (both sides). Pour the marinade into a flat pan or plastic bag and add the meat. Marinate up to 24 hours. • I used as a sauce in a basic stir fry. Delish! Although January, we've had unseasonably sunny - but chilly - weather in the Bay Area. 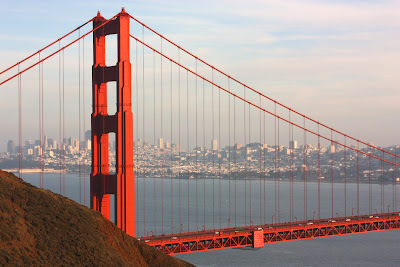 The weather prompted me to pack up my camera and head to San Francisco for a day of outdoor shots and of course, food. Although not planned our lunch and dinner places were somewhat similar in nature (Asian) and both meals involved noodles. Lots of them. Luckily, I was in the mood for spicy, brothy and warm which both served up in spades. The first, PPQ, is a great place to grab a quick and reasonably priced lunch. The second, Ramen Parlor, is part of a small but growing empire of ramen houses located in San Mateo CA. Although I loved the ramen at Ramen Parlor, the small bites are a must. Make sure you try the beef skewers and the fried eggplant. Skip the crab fried dumplings as the whole plate is a bit of a mess. Any of the ramen bowls are a winner but beware: the portions are fairly substantial so don't add the "extra noodles" unless you REALLY think you need them! We didn't add them and were fine. My standard fave: the pork vermicelli salad with spring rolls. The best of all worlds: BBQ'ed pork, crispy spring rolls and flavorful vermicelli. YUM. I ordered the ramen with the miso broth although I really wanted the pork flavor. Because I had the pork vermicelli for lunch I thought it might be overkill until the dish arrived with big pieces of fatty pork on top! As mentioned above, Santa Ramen and Ramen Dojo are in the same family as Ramen Parlor. All have long lines so be patient because this won't be a quick hit for lunch unless you get very lucky. The Golden Gate Bridge: always breath-taking! It wasn't planned but for some strange reason I ended up awash in dumplings by the end of the day. Dim sum at China Village kicked things off with Shanghai Dumpling Shop the finale. Both places were super satisfying and a nice way to spend the bulk of my Sunday. Okay, I did find other things to do during the day besides eat which makes everything seem a bit more acceptable (and it IS the holidays after all). The pork dumplings are a "must try" item on the extensive - and inviting - menu. Had I not gone overboard at China Village earlier in the day I might have ordered more. Instead we settled for the pork dumplings and ma po tofu (whoooo...spicy!) I loved this place and can't wait to return. Hint: get there early. The place was PACKED when we left (around 7:30 on a Sunday evening). Like many who have tried Silver House, it’s true that some of the best items are found on the white board which needs some translation. The item we chose, a steamed giant clam with clear noodles, arrived with a garlicky broth perfect for dipping rice once the noodles were gone. If you try one thing at Silver House, try this and you won't be disappointed! Good, well-priced Thai in a comfortable and quaint setting. Like it’s namesake, Tuk Tuk actually has a Tuk Tuk located in the middle of the restaurant. Make sure you try one of the curries which are pleasantly spiced and richly flavored. 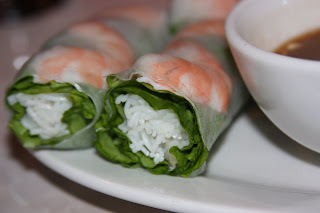 Don’t be deterred by the orange colored exterior and green neon lit windows which make up Com Tam Thanh. The food is fantastic and the service, while sometimes a bit too efficient, make up for the somewhat overbearing, design-challenged exterior. What I ordered: the standard rice vermicelli with a pungent fish sauce plus prawn wrapped sugar cane and an egg roll. I’ve had egg rolls but I must say what an egg roll it was! Filled with a delicious meat and veggie combo and expertly fried (not greasy) to give off a slightly nutty taste sent me to foodie heaven. My dining companion ordered a plate with broken rice, that wonderful version of the rice served at Slanted Door in SF with the texture and size of a large couscous. I can’t tell you the name of the dish but it looked fascinating with the centerpiece of broken rice and fried egg perched on top all surrounded by pieces of grilled pork. It was Friday night and I needed some good grub and a cocktail. Good thing Thai Time was around the corner. A nice friendly atmosphere, killer cocktails and No. 62. Always delicious (prawns, peas, corn, tomatoes in a curry cream sauce) but tonight pretty spicy. If you want it mild, make sure you request it! Chicken lettuce wraps - chicken mixed with pine nuts and scallions served in iceberg lettuce. The finishing touch: chili-lime sauce, peanuts and toasted shallots. 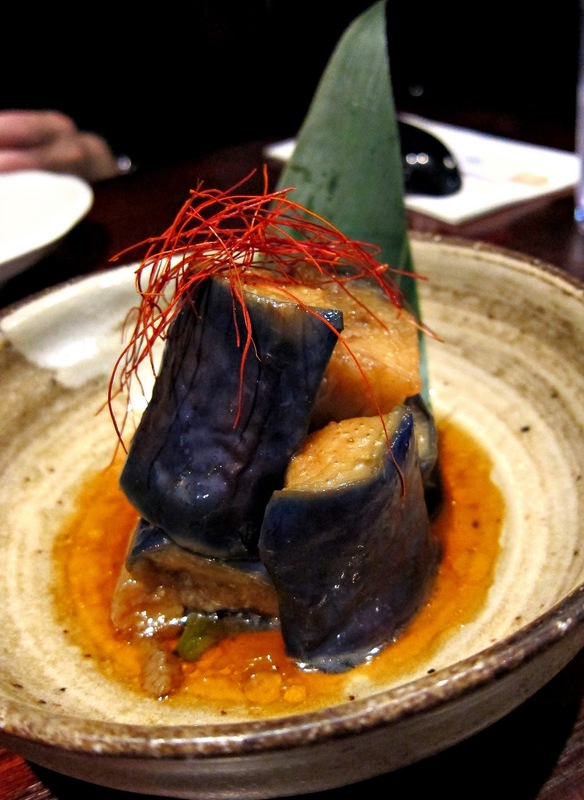 Spicy Japanese eggplant served with scallions, coconut milk and onions. Wonderful. I have to say it's been a while since my last visit. After tonight I don't remember why, but am already planning my next dining experience. Izakaya is easy to miss, but if you like sushi and Japanese food, this place should NOT be missed. To get to the actual restaurant you have to enter the place next door (one of the Benihana-style places where they cook the food in front of you.) Once inside, there are few tables in the place. The standout dish on the menu is the spinach with sesame sauce. It’s nutty, healthy and a subtle star on the menu. And the sushi is always fresh and reasonably priced. Love this place! A basic stir fry made less basic with my favorite Asian Marinade. Mix together all ingredients. Heat gently over low-med heat. *This is a great marinade for flank steak and will make enough for 3 lbs. Take your flank steak, pierce all over with a fork (both sides). Pour the marinade into a flat pan or plastic bag. Marinate up to 24 hours. * Good for chicken too! * Also a great sauce for wok-cooking. Add your veggies, chili sauce and tofu, then stir fry. Top jasmine broken rice for a sensational meal! Click here for sourcing details. On the flight from San Jose to Bellevue I spent a good deal of time discussing my favorite topic: food. Turns out my fellow seatmate was a bit of a foodie too. We discussed restaurants in San Francisco, San Diego and Seattle. We talked about Gary Danko, Michael Mina and the French Laundry (neither of us had been.) We also talked about simple foods we like; things like macaroni and cheese (me) and Pho (him). 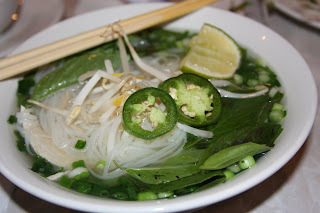 As I made my way to my destination and thought about lunch, my thoughts turned to, of course, Pho. It was like my brian was suddenly pre-programmed to head in the direction of the nearest establishment serving Pho. Who was I to resist? With some dismay I realized the area my mother lives in is thick with fast food chains and light on Asian foods. However, I remembered a small Vietnamese place tucked away and thought I'd give it a try. I Love Pho is a pretty good name and although speaks to the food itself (and not the restaurant) is what I said at the end of the meal. Food was fresh, tasty and served fast (which could qualify it as fast food). The restaurant itself has a well balanced ambiance and is comfortable yet clean. I have to give this place high remarks and hope to visit again soon.